during practice for the Monster Energy NASCAR Cup Series Auto Club 400 at Auto Club Speedway on March 15, 2019 in Fontana, California. NASCAR issued one fine after the Auto Club Speedway race weekend in Fontana, Calif., that culminated in Sunday’s running of the Auto Club 400 for the Monster Energy NASCAR Cup Series. Chris Gabehart, crew chief for Denny Hamlin on the No. 11 Joe Gibbs Racing team, was fined $10,000 for a loose or missing lug nut discovered in post-race inspection. 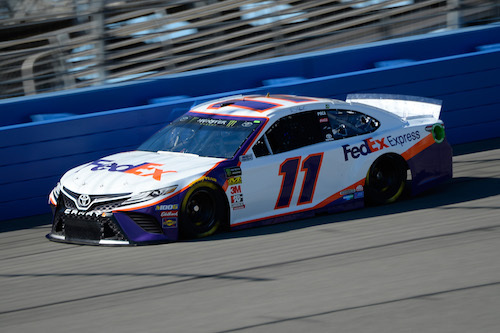 Hamlin finished seventh in the Auto Club 400. The NASCAR Xfinity Series also raced at Auto Club Speedway last weekend, but no penalties were issued to competitors in that series after their race March 16.